Mazda invited us to the Texas Hill Country near Austin to test drive the completely redesigned Mazda6. Everything about this vehicle is new, including the platform, engine and transmission, all designed from scratch from the ground up to work together. The engineers at Mazda even had to create all-new manufacturing processes to enable the scaling of the hardware for different models. The result is a vehicle that should do well in the super-competitive mid-sized sedan market. Check out the slideshow above, and you’ll see that the new Mazda6 is a beautiful vehicle from all angles. The front face of the vehicle is less pronounced than previous Mazda designs, helping to create a more refined look while retaining the aggressive feel of the Mazda brand. I particularly like how the chrome under the front grille extends out to follow the upper curves of the headlights, and the obligatory LED accents are perfectly placed to help create the image of speed and power. The designers at Mazda had some clear goals as the re-imagined this vehicle. The Mazda6 currently captures a youthful, sporty image, and they wanted to reposition the 2014 model with “a more sporty, sophisticated and premium image.” They also wanted to position it as clear step-up from the youthful Mazda3. The design theme of “Kodo – Soul of Motion” permeates every decision made with the new vehicle, with an emphasis on proportion, stance, brand signature and aerodynamics. The muscular but fluid lines make the Mazda6 look like it’s ready to run. Overall, this new design is a head-turner that should generate significant buzz for the vehicle and the brand. The goal of creating a more premium image led to significant upgrades to the interior of the Mazda6. The all-new seats were very comfortable, and both the standard interiors and the leather option definitely had a more luxurious and elegant feel. The leather in particular offers a combination of hidden and contrast stitching that adds to the beauty of the interior. They reduced the size of steering wheel a bit to give more of a racing feel to the vehicle as well. The designers avoided a bulky center stack in favor of a more horizontal design across the dashboard, and the controls are presented in a manner that makes them very easy to use. The screen and TomTom navigation tools were adequate, but they won’t blow you away as the screen isn’t very large. Still, the overall design and comfort level of the interior will definitely attract a wide variety of consumers. 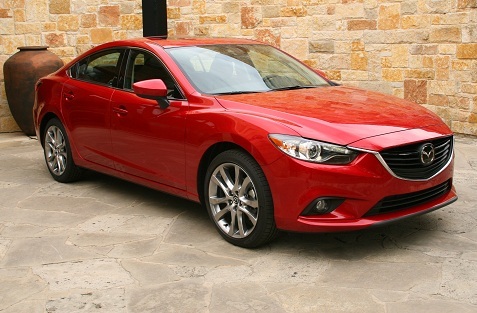 Mazda is all about building cars that are fun to drive, and they achieved that goal with the 2014 Mazda6. The rolling hills near Austin provided a great testing environment with plenty of tight curves along with rapid inclines and declines. The thought that struck with me the most was how agile the Mazda6 felt. The steering, handling and braking were all very impressive. The Mazda6 we tested featured the all-new SKYACTIV-G 2.5L four-cylinder engine that is available now with the launch of the vehicle, and Mazda will be providing a SKYACTIV-D 2.2L Clean Diesel Engine for the second half of 2013. This will replace the option of a six-cylinder engine which may disappoint some buyers but may also help lead to a resurgence of diesel in the US market. It will be interesting to see how this plays out. Six-cylinders are becoming much rarer in this mid-sized market, disappointing those of us who crave power. Still, Mazda went to great lengths to push the limits of performance and efficiency with its new SKYACTIV engine technology, and the efforts produced solid performance for the new engine. The engine generates 184 horsepower and 185 lb-ft of torque and the 6-speed automatic version offers up impressive fuel mileage at 26 MPG city and 38 MPG highway (30 mpg combined). Mazda has also added some impressive technological features that make the vehicle more competitive in this segment, with Mazda Radar Cruise Control, Front Obstruction Warning, Lane Departure Warning, High Beam Control, Rear Cross Traffic Alert and Smart City Brake Support. Mazda’s all-new flagship model will be priced competitively in this segment, with the Sport model starting at $20,880 and the Grand Touring version topping out at $29,495. Consumers can definitely save some money choosing the Mazda6 over much of the competition without sacrificing performance and styling. I suspect the eye-catching design will lure many consumers to give this vehicle a try, and like all Mazdas it’s fun to drive, so Mazda will likely have another hit on its hands.